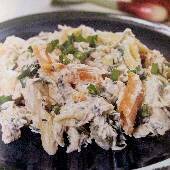 This wonderful pasta salad calls for chicken, carrots, celery, potatoes, onions, parsley, and pickles. Tip:Try this recipe with leftover chicken soup! Rinse the chicken well. In a stew or soup pot, boil the chicken, who onion, celery, carrots, salt, and pepper in enough water to cover for 25 minutes. Add the potatoes and continue to boil for approximately 35 minutes. Test the chicken for doneness with a fork. Remove chicken, potatoes, and carrots from the pot. Remove skin and bones from chicken, and cut into small pieces. Dice the potatoes and carrots. Set aside. Strain the liquid from the pot and use it to cook the pasta according to package directions. Add water if needed. When done, drain well and toss with the olive oil. In a large bowl, combine the pasta, chicken, potatoes, carrots, green onions, and parsley. Mix the yogurt and mayonnaise and toss with the salad. The salad can be refrigerated, covered, for 4-5 days. Remove from refrigerator for 15-20 minutes before serving.